For starters, I really hate writing this piece about Frank Howard. It’s unnatural, and to the extent I have to report on the facts, I still hate doing it. But I am reporting the facts. I thought Frank Howard would be the last candidate among the Republicans running for the 6th Congressional district to embody Robin Ficker’s personal and duplicitous style of attacking. Howard took a page directly from Robin Ficker’s losing political playbook and attacked Amie Hoeber via a dishonest, last-ditch, low-class letter. Howard’s campaign has been virtually nonexistent from the start; it’s now treading water in the deep end. I guess I understand the desperation Frank is facing. We’ve all been there. Howard is feeling the heat. He’s raised practically no money. His volunteer base isn’t growing. And his campaign – I’ll just go ahead and say it – really isn’t that interesting. He’s right on a few liberty issues I care about, but he hasn’t capitalized on his liberty creds. 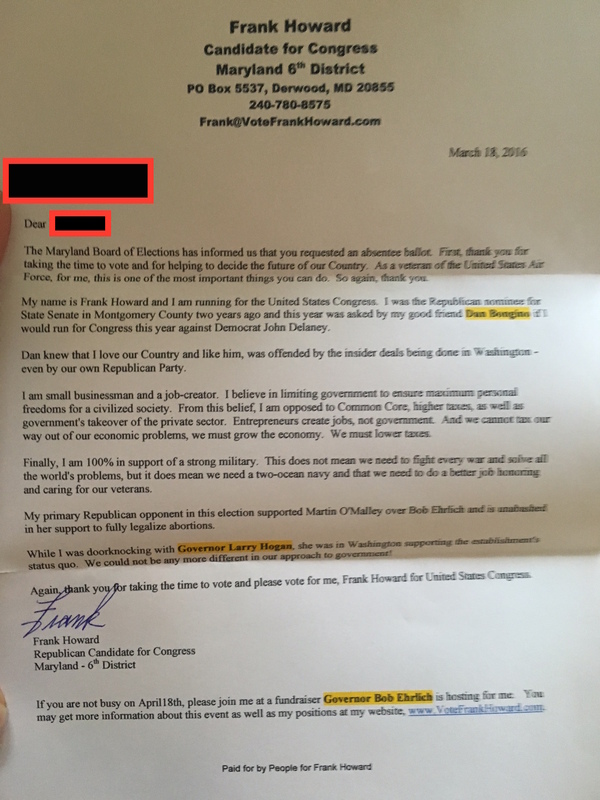 Today, a source forwarded me a letter written by the Howard campaign that was apparently mailed to Republican absentee voters in the 6th congressional district. Yeah, it’s a standard, unimpressive form letter. Nothing out of the ordinary. You’re lying. You know it’s a lie. And you should come clean. It is true that Amie Hoeber donated $500.00 to Martin O’Malley’s campaign in 2010. She freely admitted the donation. She explained that her donation did not equate to a vote. Hoeber’s neighbor held an event that featured former Governor O’Malley. She attended the event because she was asked. What Frank Howard won’t tell you in his silly letter is that he cut a juicy check for a socialist-leaning left-wing liberal Democrat (further left than Nancy Pelosi) in 2007. Howard supported – let’s go ahead, for arguments sake (Howard’s argument) – Karen Montgomery in 2007. Howard’s $250.00 check to Citizens for Karen Montgomery should raise the same level of concern, shouldn’t it? Apparently Howard’s donation doesn’t meet the same logical standard. Hum. Why would Frank Howard donate to a left-leaning socialist Democrat? Wow. Is Frank Howard a Democrat? Socialist? Did he vote for Martin O’Malley? Did he support Barack Obama? Yeah, if these questions seem absurd to you (they are), then Frank Howard’s letter should be viewed with equal absurdity. 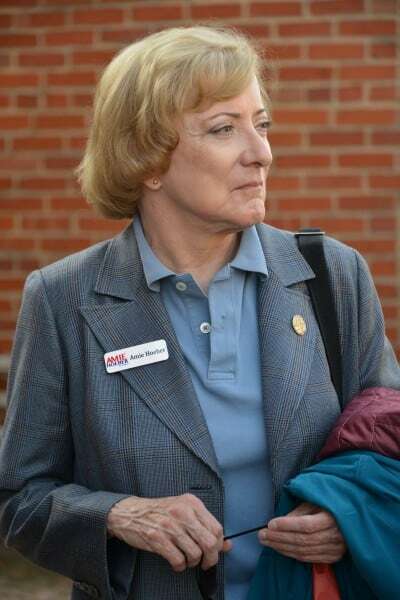 So did Frank Howard vote for Karen Montgomery after he sent her an incredibly gracious donation of $250.00? Based upon his financial support for Montgomery, and Howard’s reasoning, it’s safe to assume Howard did vote for Montgomery. Back to the letter. Howard then goes on to accuse Hoeber of supporting full legalization of abortion. Frank – that’s another lie. In fact, it’s a Washington drive-by attack we have grown to hate. Establishment Frank Howard is already fitting in nicely with the Washington elitists using lies to attack his opponent. Howard’s table at the Capitol Hill Club is probably already in the making. Those boiled peanuts sure taste great with a glass of hypocrisy. Amie Hoeber never once said she supports full legalization of abortion. She’s never said anything remotely close to that. Howard’s attack is everything wrong with Washington. The drive-by attacks and slimy implications are everything – and I mean everything – wrong with the culture of D.C. that Howard so desperately seems to want to join. Another Washington establishment-type in the making. So much so that the ultra-liberal Washington Post endorsed Howard’s failed state senate campaign in 2014, alongside multiple liberal Democrats in very liberal Montgomery County. No, Frank, she was not in Washington supporting the status quo. She was, however, running a successful business and consulting with foreign governments and national security experts, contributing to our national security apparatus. She was busy protecting our troops from chemical and biological weapon attacks. If contributing to our national security is considered status quo, I’ll take status quo any day. 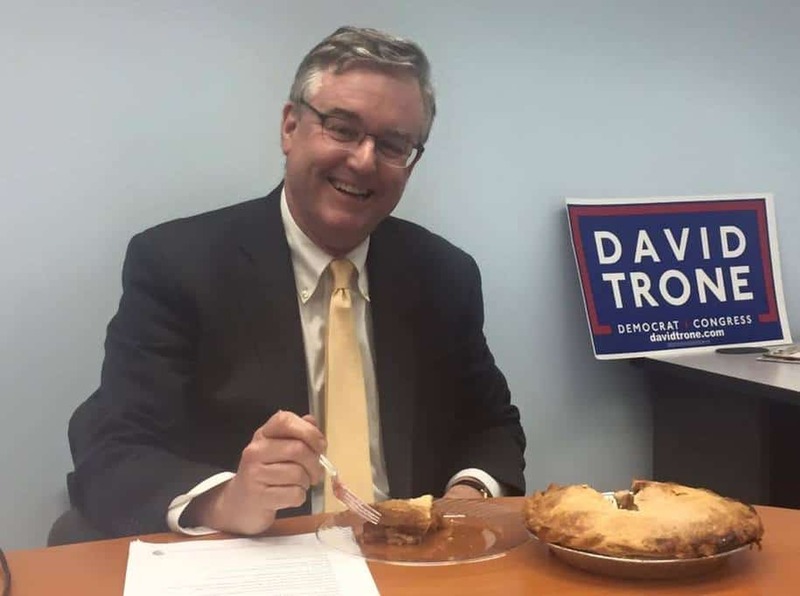 You see, this is how Washington politicians execute drive-by attacks. Remember, Howard’s 2014 Maryland Senate campaign ended in a crushing defeat to the same opponent he cut a check for only three years prior. Then Howard decides to run for Congress last year after his stinging defeat. Straight out of the Robin Ficker playbook. Howard has also told me that if he loses in the Republican primary this year, he’ll run again in 2018! Another Robin Ficker political move. Howard and Ficker may want to start campaigning together. This is all very disappointing because Frank Howard is a good and decent man. I consider him my friend. But these petty and deceitful attacks are beneath Mr. Howard. Howard’s letter reeks of severe desperation. It’s sad, really. Amie Hoeber has never once attacked Frank Howard. Not once. And trust me, there is A LOT to attack Howard with in this campaign. The opposition file on Howard is massive. I haven’t even grazed the surface. Howard calls Hoeber “establishment” in his poorly-written letter, but it was Howard who went congressional district shopping last year. Howard was ready to run for the 8th congressional district until he realized his political journey would be virtually unattainable. Then he settled on the 6th – ostensibly because he thought – and obviously still believes – it is within his grasp of winning. Not with these attacks it isn’t. Hypocrisy is what I detest most about in politics. That’s why I’m so fervent in my writing. For me, I haven’t even chosen the candidate I’m going to support on April 26. In this congressional Republican primary, I believe David Vogt, Amie Hoeber, Harold Painter and a few others would do a fine job in Congress. But disgusting, low rate, Donald Trump attacks don’t fly in the 6th District – not with me, and certainly not with the voters. If you want to run a serious campaign, Mr. Howard, you could. You could run on your record. It’s not a bad one, either. So stick to talking about your business experience. Maybe then you’ll get more than a few thousand dollars in campaign donations. Frank Howard is a congenial, avuncular guy. His latest attack, notwithstanding, on Hoeber certainly doesn’t match the quality of his character. I don’t know whether Lawrence Scott is working with the Howard campaign or not. But Scott did tell Amie Hoeber that if she refused to work with him (she did) then he would work for Frank Howard. The letter above is perfectly indicative of Lawrence Scott’s trashy campaign style. Frank Howard’s campaign needs a Red Bull. But sending letters with lies about his opponents isn’t the way to jump start his campaign to a primary victory. Maybe Bob Ehrlich should think twice about appearing at a staged event for Howard on April 18. After all, Howard did donate to a socialist leaning liberal Democrat. 1 Comment on "Frank Howard’s desperate attack on Amie Hoeber"